Heath Toffee Cheesecake Brownies are divine. Really. 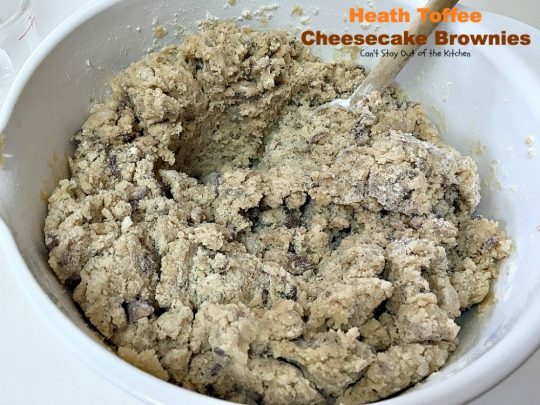 They start with a chocolate chip cookie dough but use Heath English Toffee Bits instead of chocolate chips, then a luscious cheesecake layer is stacked on a layer of cookie dough. 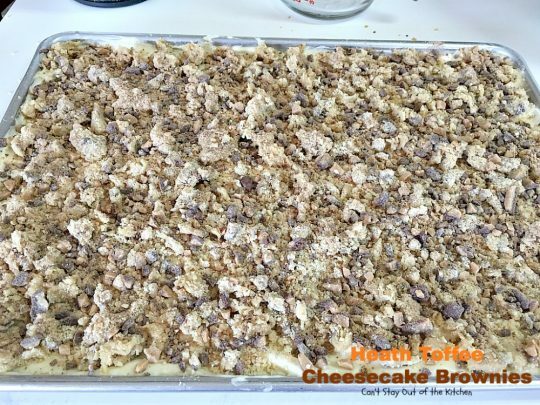 The cheesecake has more cookie dough crumbled over top and sprinkled with more Heath English Toffee Bits. Oh my. Rich, decadent, amazing. I love these jewels and believe you will too. I have over 1,100 recipes posted on this blog and I think over half of them are cookies and brownie recipes! No kidding. I make a lot of them. My husband likes to take cookies with him whenever he visits friends so I make goodies frequently and store them in the freezer until he’s ready to take them. We were at a meeting this week with trustees for his company and several people came up to me and told me how much they enjoyed the goodies he had brought to them. 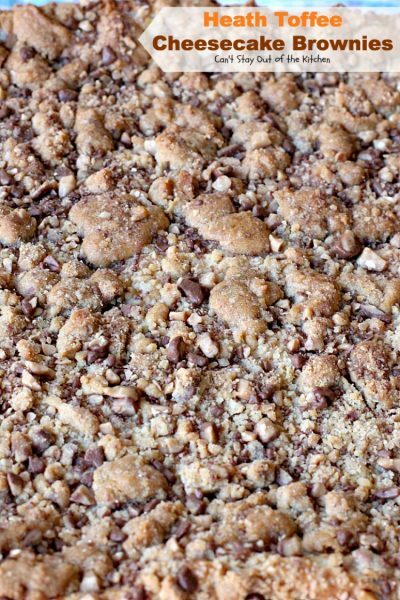 I enjoy baking, and cookies and brownies are among the easiest to transport or pack up and take without making a mess. A couple of weeks ago, I spent about eight hours a day for four days, restocking my freezer. 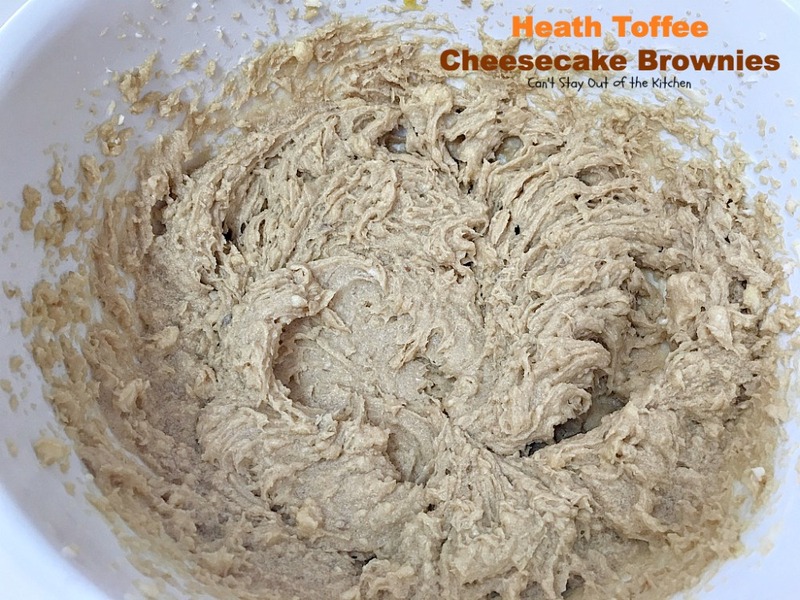 Heath Toffee Cheesecake Brownies were one of the 12 different kinds of brownies I made that week. I also made up a batch with M&Ms, Red Velvet, and Creme de Menthe. along with lots of other delicious brownies. So now my freezer is stocked for a couple of months and I can get on with the business of packing up the few things we have here in our rental home in preparation for our move to a new home in a couple of weeks. I wasn’t prepared for this process to be as grueling as it has been. We’ve had continuing challenges all along the way. I will sure be glad when everything is finally finished or fixed and we’re able to close on our home. If you need to treat yourself to a chocolate and/or toffee fix, give these luscious Heath Toffee Cheesecake Brownies a try. 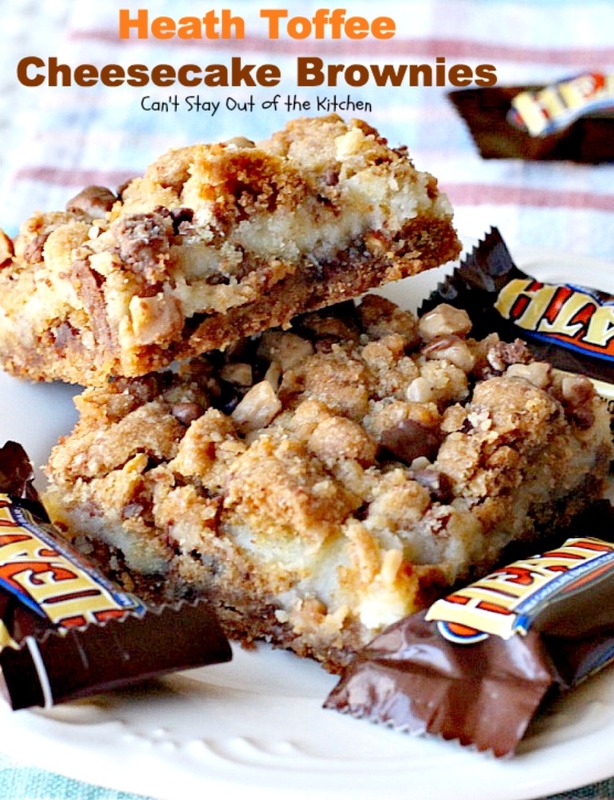 You’ll be salivating over every bite. 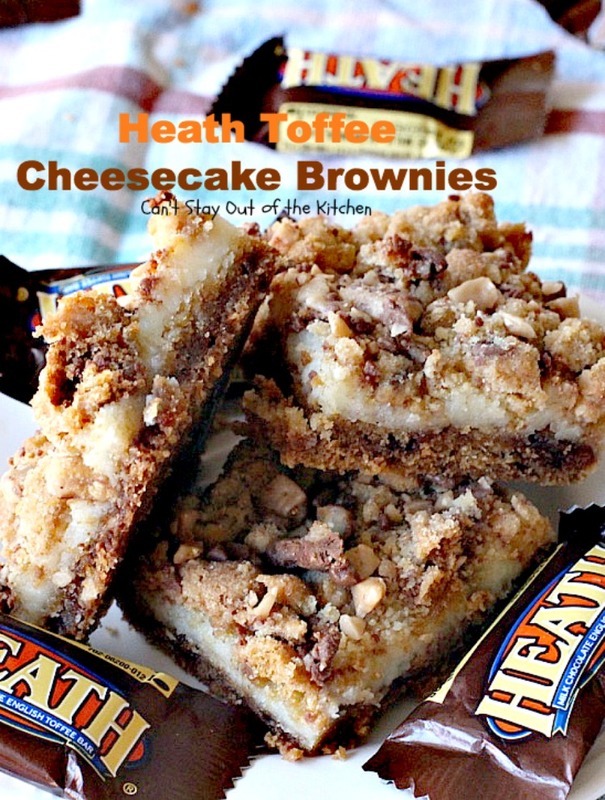 Heath Toffee Cheesecake Brownies are spectacular. If you enjoy Heath English Toffee Bits, you’ll love these brownies. 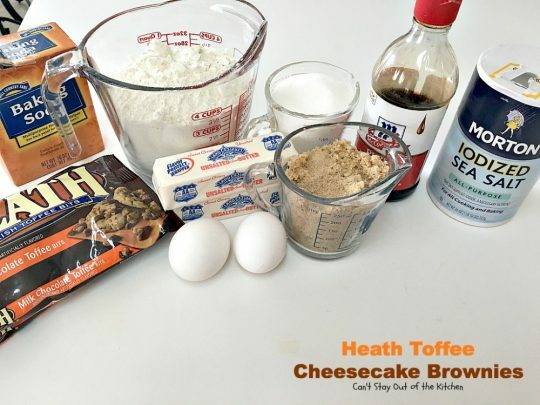 Take a platter of Heath Toffee Cheesecake Brownies to your office parties and watch them disappear! Soften butter. 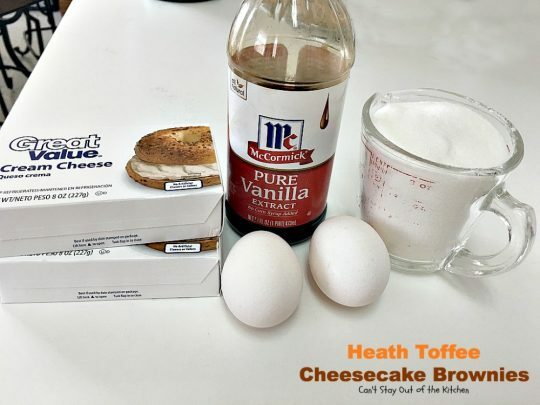 Add sugar, brown sugar, eggs, vanilla, salt and baking soda. Add UNBLEACHED all-purpose flour. Bleached flour toughens baked goods. Add 1 1/2 bags Heath English Toffee Bits. 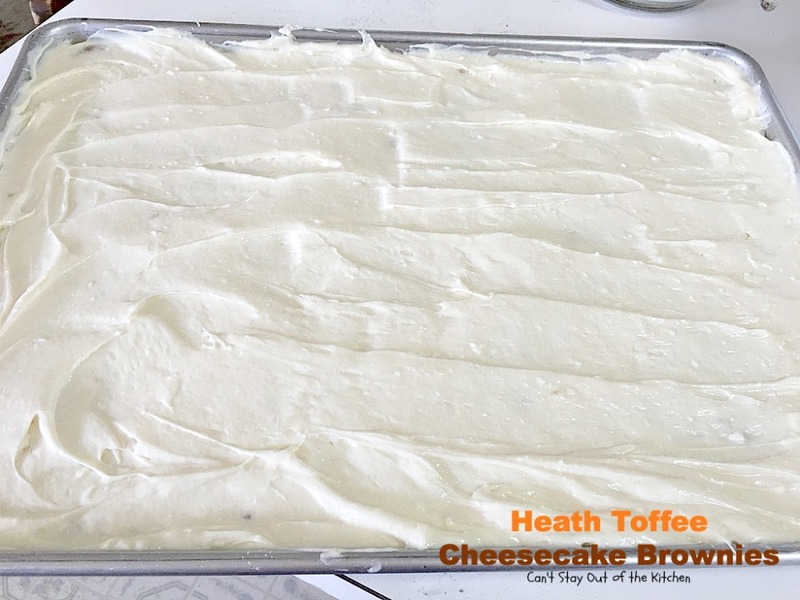 Spray an 11″x17″ jelly roll pan with cooking spray. 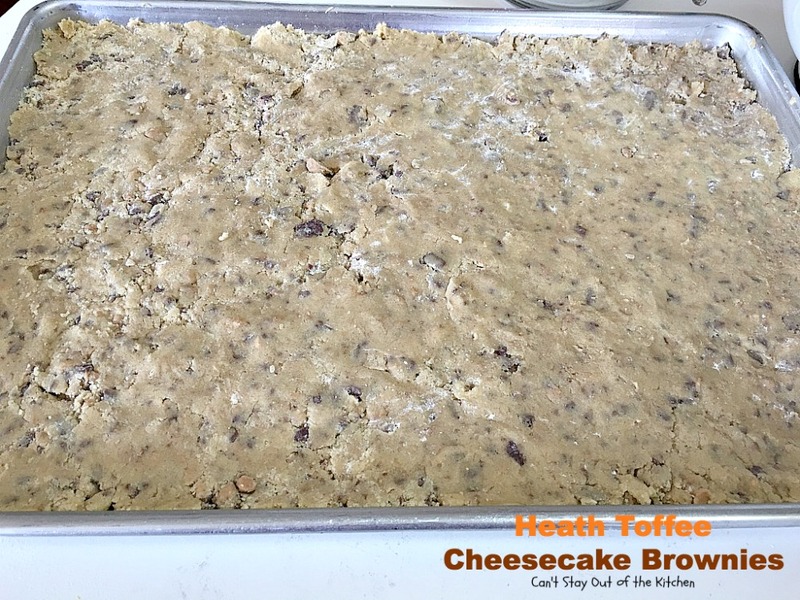 Press half or three-quarters of the cookie dough into prepared pan. Mix ingredients with an electric mixer until no lumps remain. Spread cheesecake layer over top of cookie dough. 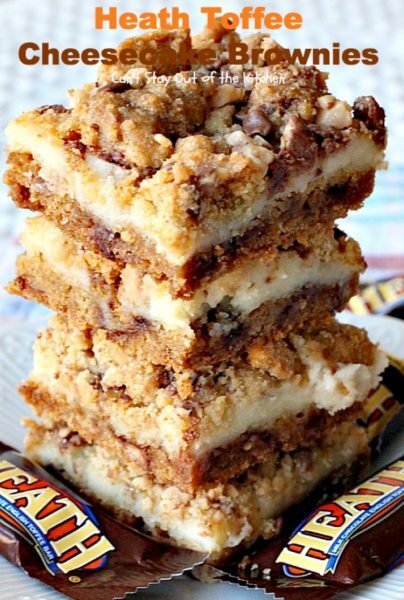 Crumble remaining cookie dough over top of cheesecake layer. 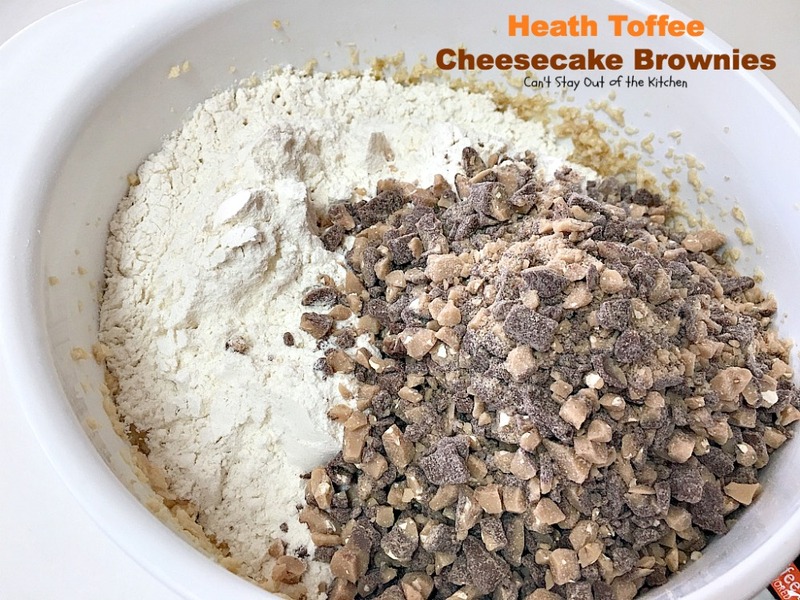 Sprinkle remaining Heath English Toffee Bits on top. Bake at 350 for about 35-40 minutes or until a toothpick inserted in center comes out clean. 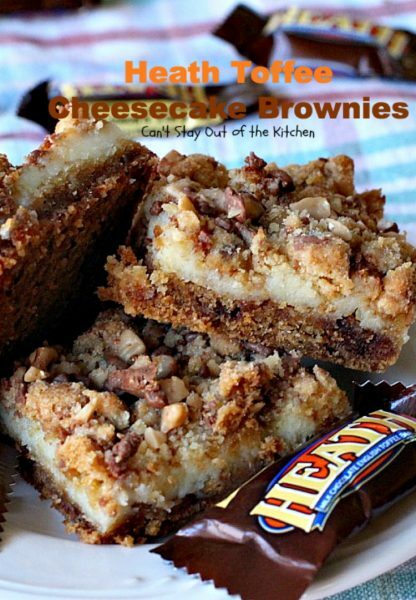 The cheesecake layer makes these brownies special. Every bite of Heath Toffee Cheesecake Brownies will have you drooling! These are great brownies for tailgating parties. This luscious brownie has a cheesecake layer sandwiched between two layers of Heath Toffee cookie dough. 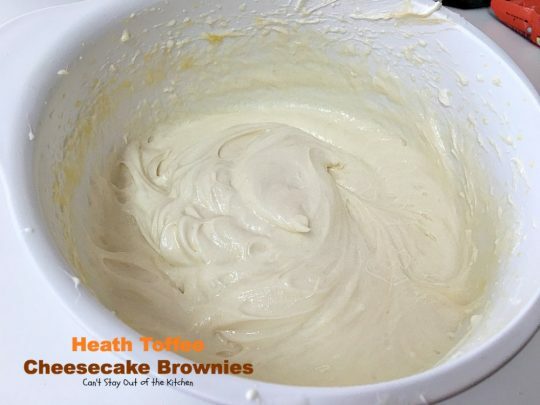 Heath English Toffee Bits makes these brownies special. 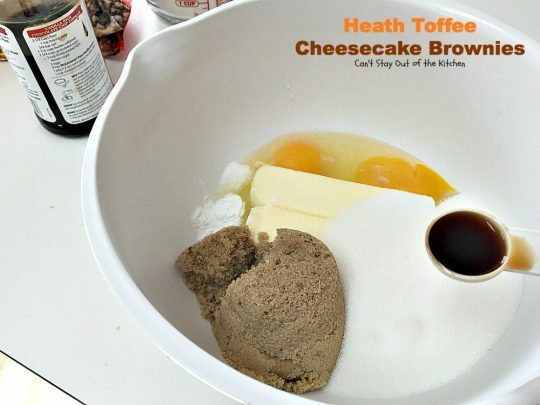 Stir in flour and 1-and-a-half packages Heath English Toffee Bits. Spray an 11"x17” jelly-roll pan with cooking spray. Spread cream cheese filling over top of Heath Toffee cookie dough layer. Sprinkle ½ package of Heath English Toffee Bits over top of cookie dough layer. 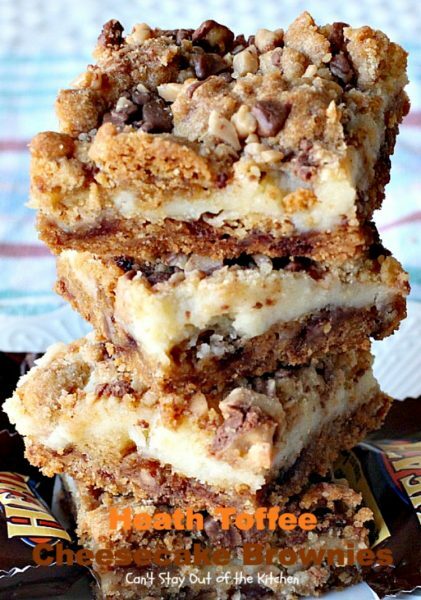 This luscious brownie has a cheesecake layer sandwiched between two layers of Heath Toffee cookie dough. [url href=”https://www.thehersheycompany.com/brands/heath/english-milk-chocolate-toffee-bits.aspx” target=”_blank”]Heath English Toffee Bits[/url] makes these brownies special. Spray an 11″x17” jelly-roll pan with cooking spray. 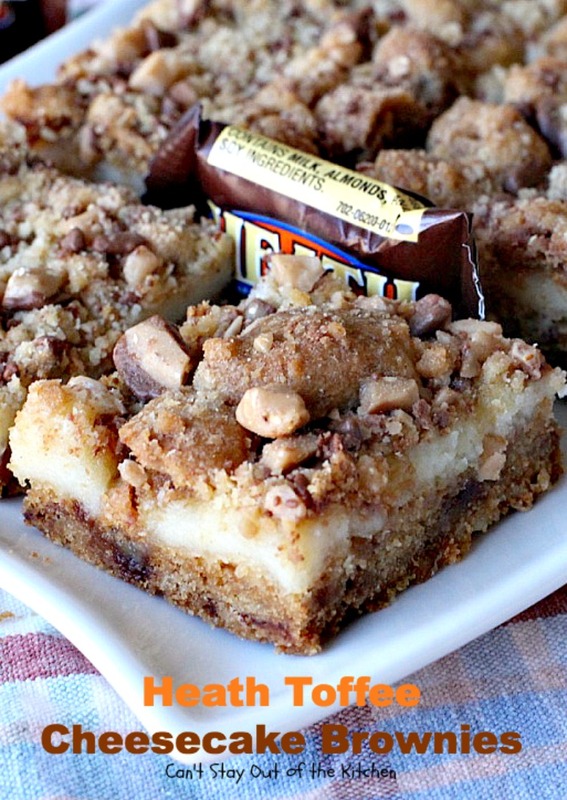 The chewy toffee bits are heavenly. 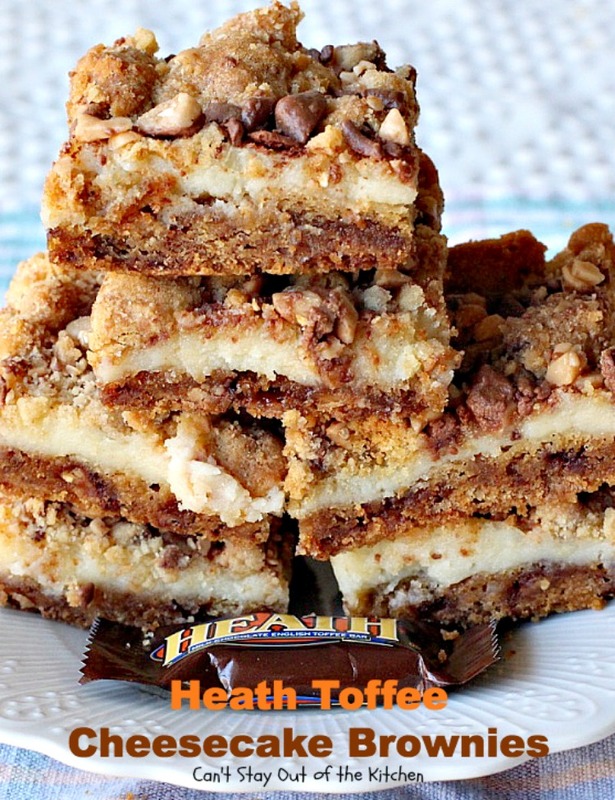 Heath Toffee Cheesecake Brownies are a toffee lover’s delight! How did you spread the remaining cookie dough after you put the cheesecake filling on ? Hi Shelby. 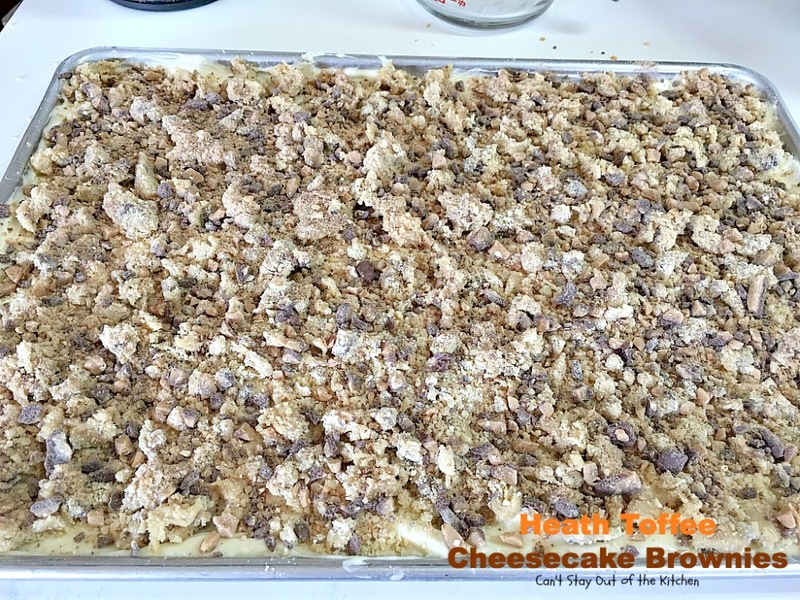 I crumbled the dough on top–just pulling off little pieces and spreading it around over top of the cheesecake layer. 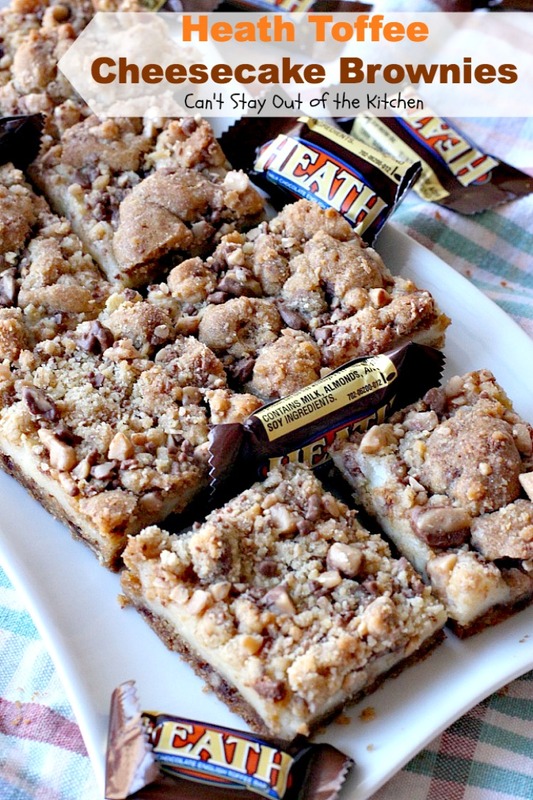 What size pan would you use if you did half recipe of heath Bar brownies? Hi, Amy. I’d probably use an 8×12″ baking dish or perhaps a 9×9″ dish. Enjoy. Do these need to be refridgerated to store? Yes, I would refrigerate them Emmy. Thanks for stopping by.